1 If you took a can of paint and splattered it across your bedroom wall, what do you think would happen? You would have a lot of fun creating an explosive, dripping splash of color, but you would probably also get an explosive reaction from your family. Throwing paint on a wall or a canvas is one way to create abstract art, but you probably wouldn't want try it in your room. 2 Often we think of art as showing things realistically, but not all art is like that. Abstract art doesn't usually look like anything in particular. Abstract artists want to show their emotions in their art. They are not concerned about whether their paintings look real. Abstract art is very different from many traditional styles of art. 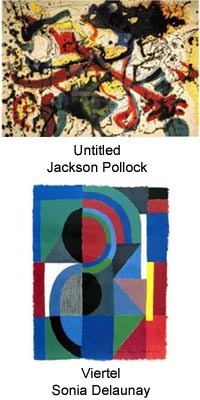 3 Abstract artists often take an object and then either make it look simpler or more complicated in their paintings. An abstract painting often has many shapes and colors in it. It can be fun to look at because you can use your imagination. You and your friends might all have different ideas about what the painting was about, or what emotion is being shown. Feedback on What Is Abstract Art?